I’m on a cleanse. Well, kinda. Okay, not really. I’m just trying to lighten up on my diet. These past holidays have left me feeling…full. J-Wis wanted tacos. Um no. So “we” compromised. And he sure was glad “we” did! I always make my fish tacos different. Sometimes I use salmon and give them an Asian twist, using ginger and soy sauce. Sometimes I fry the fillets and top them with the normal lettuce, tomato, cheese, sour cream and taco sauce. It all depends on what I have readily available in my refrigerator. Today I had some gorgeous cilantro. And this is where I went with it! What you’ll need for the Spanish Slaw. 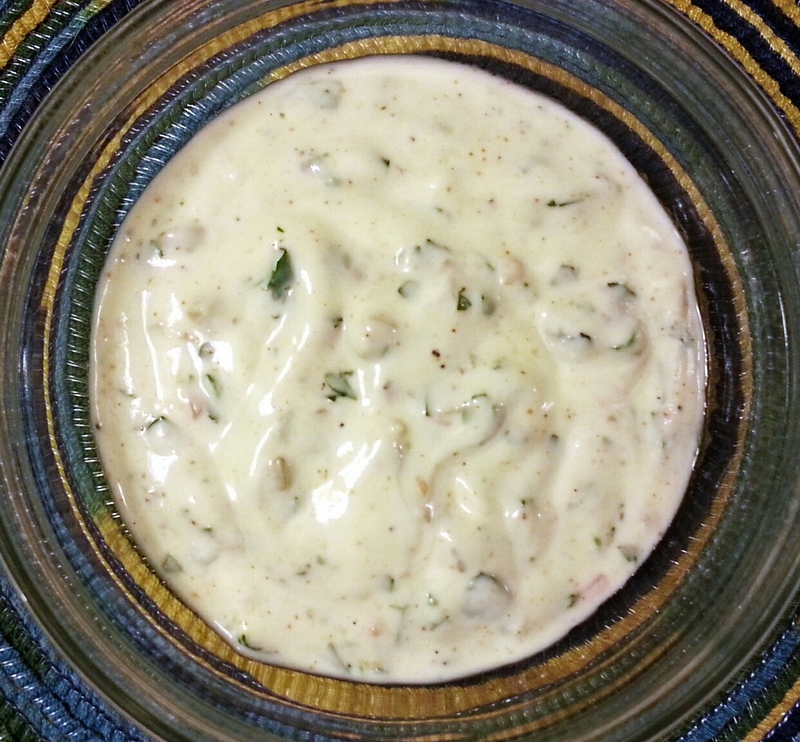 In a large mixing bowl combine mayo, red wine vinegar, olive oil, chili powder, ground mustard, salt and pepper. Add the shredded cabbage, shredded green pepper and shredded onion. Mix well. Cover and store in fridge until you’re ready to serve. What you’ll need for the Cilantro-Lime Yogurt Sauce. In a small bowl combine all ingredients. Mix well. 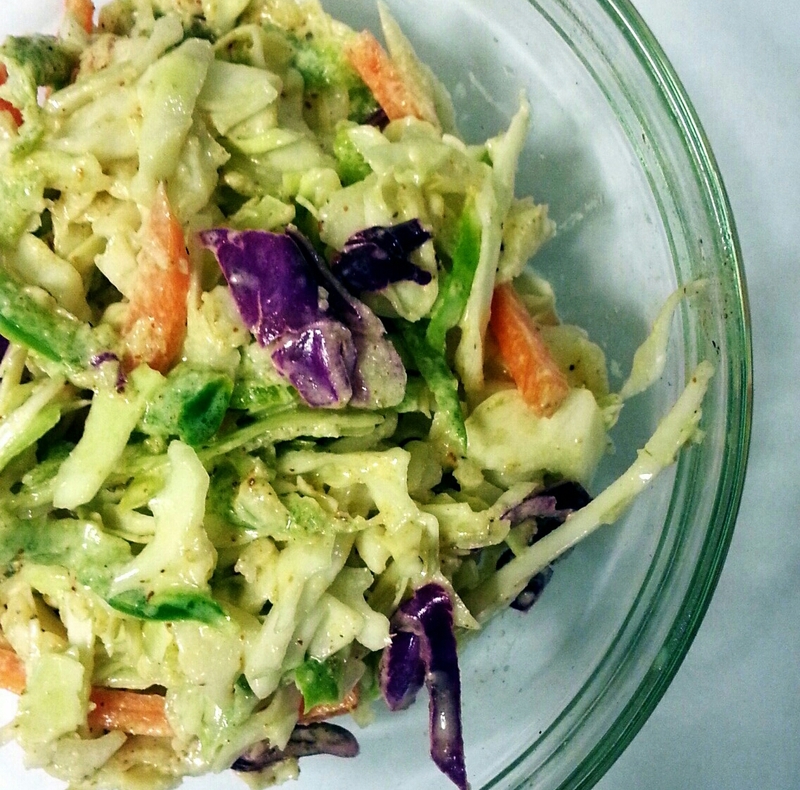 Cover and store in the fridge with the Spanish Slaw until you’re ready to serve. What you’ll need for the fish tacos. Combine garlic, onion, Old Bay, paprika and salt and pepper in a small bowl. Liberally season both sides of each fish filet. In a large skillet heat 3 Tbsp of olive oil to med-high heat. Sear each side of tilapia until golden brown and the meat flakes away easily. Gently pull the fish apart into big chunks. Lots of prep, I know! It all comes together rather quickly toward the end. We’re now ready to assemble these babies and eat! Divide the fish among each tortilla. Drizzle the Cilantro-Lime Yogurt Sauce over the fish and pile the Spanish Slaw on top. Garnish with a little shredded lettuce and chopped tomatoes and hot damn! You got yourself a meal! And a fairly healthy one too! Enjoy! 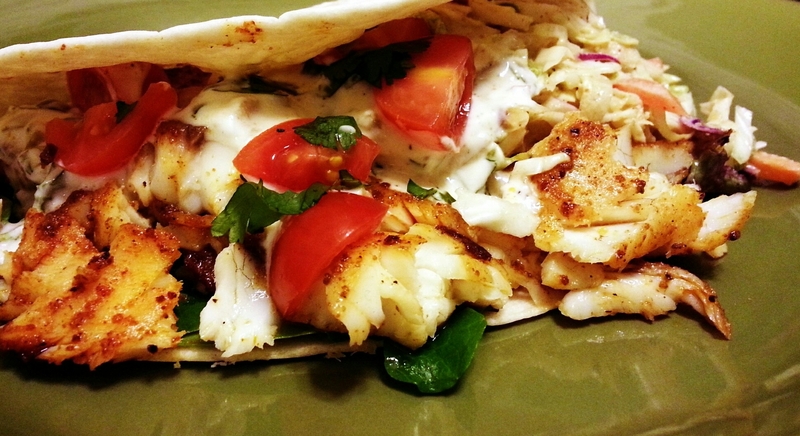 This entry was posted in Dinner, Fish, Food, Light, Recipes, Vegan/ Vegetarian and tagged Cilanrto- Lime Yogurt Sauce, Fish, fish tacos, Spanish Slaw, tilapia, white fish. Bookmark the permalink. This looks really amazing. I love all the colors in this taco. Tonite, we will have these fish tacos for the first time EVER! The pictures look delicious and it seems easy to prepare. Best part of entire recipe….NO BEANS!!!!!! !